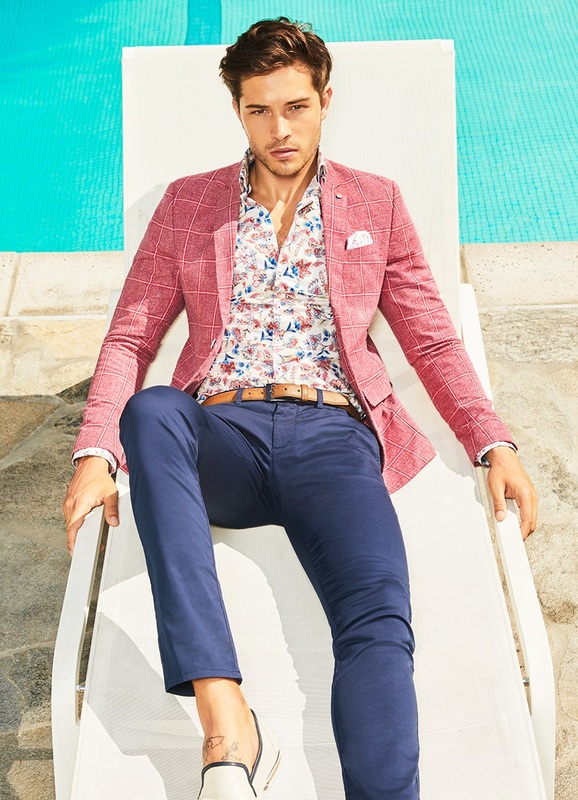 Reggie blazer pink $269, Payton shirt white/pink $149, Allonzo chino dark navy $149, Vipera reversible leather belt dark tan/black $79, Erric leather loafer ice $229. Shamus shirt floral $179, Markk suit pant grey $149, Andreas reversible leather belt black/tan $79. Emanuel shirt navy/pink $179, Allonzo chino dark navy $149, Xaviar reversible leather belt tan/navy $79. Ralston shirt white/pink $179, Tarrik suit pant blue $169, Perkin reversible leather belt dark tan/navy $79. HARRY WEARS Matthias tuxedo jacket white $299, Aster shirt white $169, Syon bow tie black $59, Newman suit pant black chintz $139. It's great being lucky and even better when you make your own. 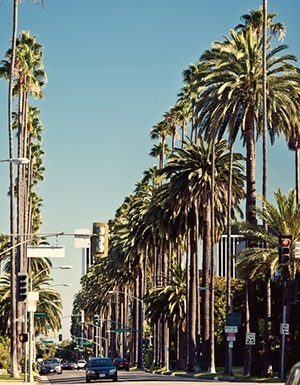 Sure, life will throw you a few strokes of good fortune – a soccer ball bouncing your way (especially when it counts) or an unexpected long-haul flight upgrade – we all love those moments when things just seem to go right. No, I've never won the lottery but I'm lucky to have been part of the POLITIX team for a decade and I've loved playing (and coaching) elite soccer for double that. Over the journey, here's what I've learnt: back yourself and your talents, on and off the field, and you'll find luck will come your way. I guess I've always tried to make my own luck and I know that when I've put in the hard yards, I can stand in front of the mirror, decked out in a POLITIX suit (naturally) and feel proud of what I've achieved. This season – make luck come your way. Dress sharp, think sharp and go for it. Get lucky. Meet your new Monday to Friday – our super sharp Modern Tailoring collection. A new mood for the modern office that’s sure to deliver wins in the workplace. 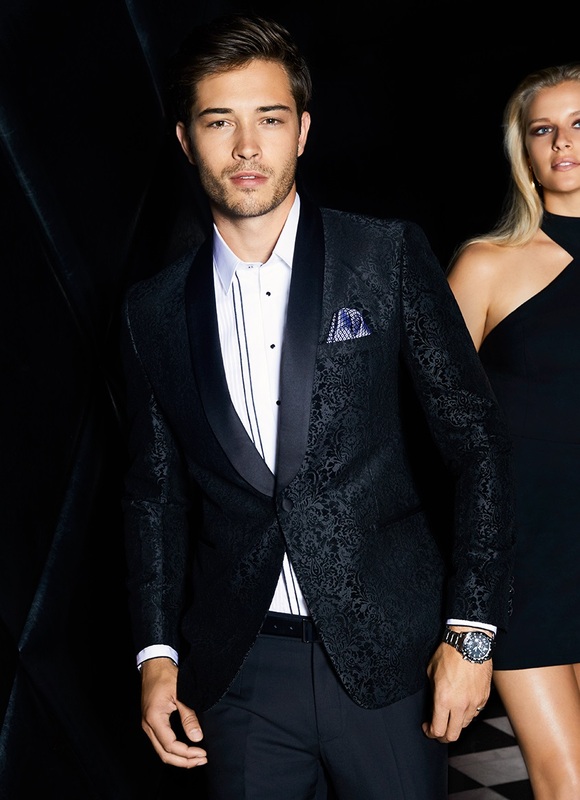 Stylish suiting and sharp separates crafted from stretch cloth with lightweight half-lined jackets designed to move with you. The finer shoulder pad, double vent and shorter pant cut a sharp silhouette. Less is more. Fisher suit jacket cobalt $289, Jarrad shirt sky $159, Jerald tie blue $69, Allonzo chino dark navy $149, Xaviar reversible leather belt tan/navy $79. Olliver suit jacket grey $299, Eddward shirt white $179, Ario pocket square navy $49, Markk suit pant grey $149, Quintus leather belt black $69. Colson suit jacket blue windowpane $299, Jarrad shirt navy $159, Aaric tie navy $69, Zac tailored pant silver $169, Konrad reversible leather belt dark tan/black $89. For men on a mission. The dense weave of our lightest stretch fabric delivers all day sharpness and comfort from the boardroom to the business lounge. 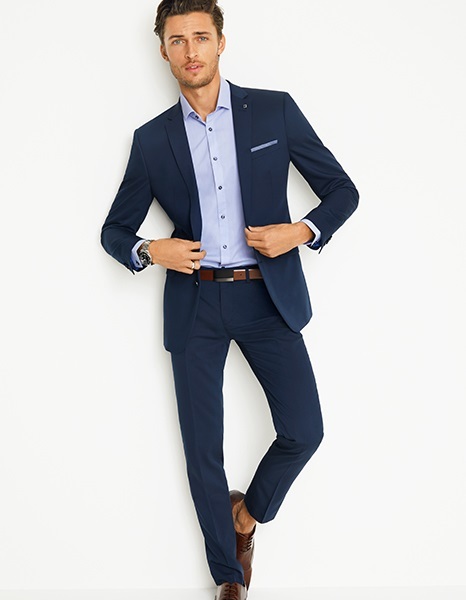 Its slim fit, fine shoulder roll, shorter pant and half-lining keep you looking - and feeling - cool when the stakes are high and the speed is on. Pro Jet Set suit jacket black $289, Eddward shirt white $179. 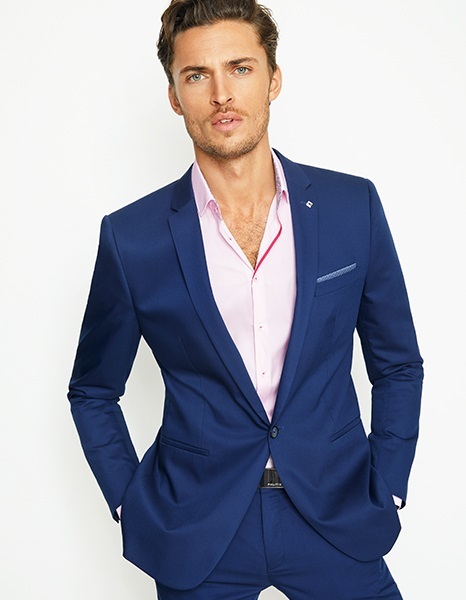 Pro Jet Setter suit jacket new blue $289, Laidley shirt pink $149, Pro Hi Flyer suit pant new blue $169, Renato reversible leather belt dark tan/black $89. 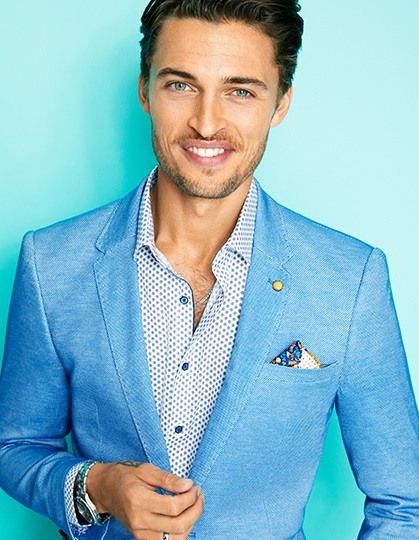 Pro Jet Set suit jacket navy $289, Oswin shirt light blue $129, Pro Flyer suit pant navy $169, Ravon reversible leather belt light tan/dark tan $89, Merlin leather shoe cognac $269. Severn suit jacket blue $299, Clint shirt white/blue $129, Sion pocket square navy $49, Tarrik suit pant blue $169, Stefano reversible leather belt tan/navy $89, Zacary leather loafer whiskey $249. Olliver suit jacket grey $299, Eddward shirt white $179, Ario pocket square navy $49, Markk suit pant grey $149, Quintus leather belt black $69, Cleavon leather shoe black $269. Desk to dawn style. 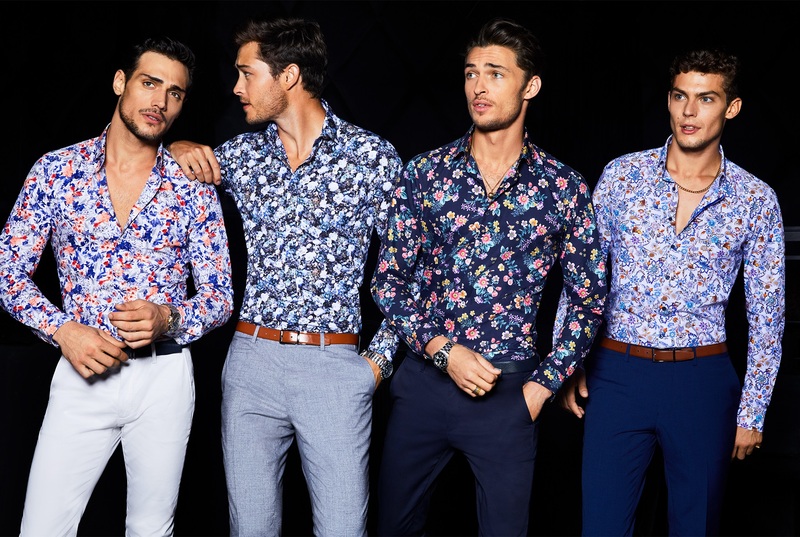 Inject life into your office outfit to close deals by day and night. 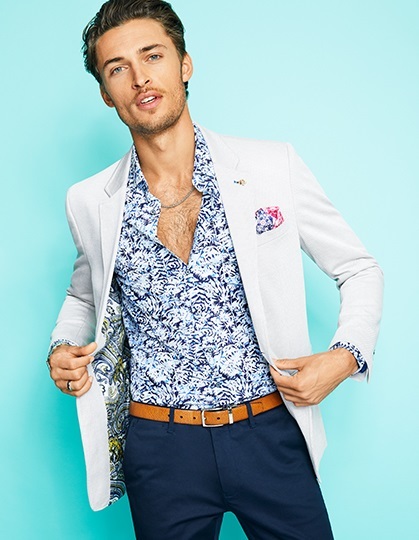 Think half-lined lightweight blazers in fresh colours and textures, popping print shirts and slim chinos, all with added stretch. Tray blazer blue $249, Oran shirt white/cobalt $149, Allonzo chino white $149, Perkin reversible leather belt dark tan/navy $79. 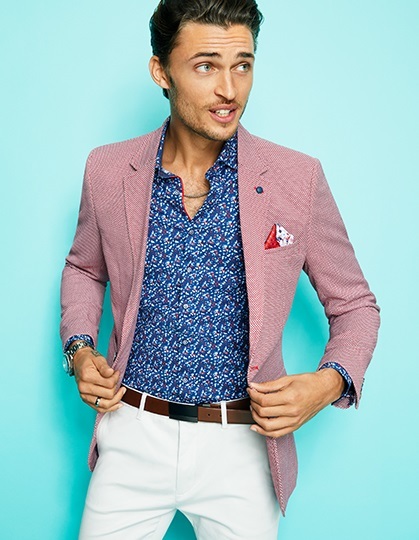 Reggie blazer pink $269, Payton shirt white/pink $149, Allonzo chino dark navy $149, Vipera reversible leather belt tan/dark tan $79. Osborne blazer red check $269, Tyrrel shirt white/pink $149, Allonzo chino silver $149, Stefano reversible leather belt tan/navy $89. Ralston shirt white/pink $179, Winsor chino new marine $149. Osborne blazer red check $269, Ralston shirt white/pink $179, Winsor chino new marine $149, Erric leather loafer ice $229. 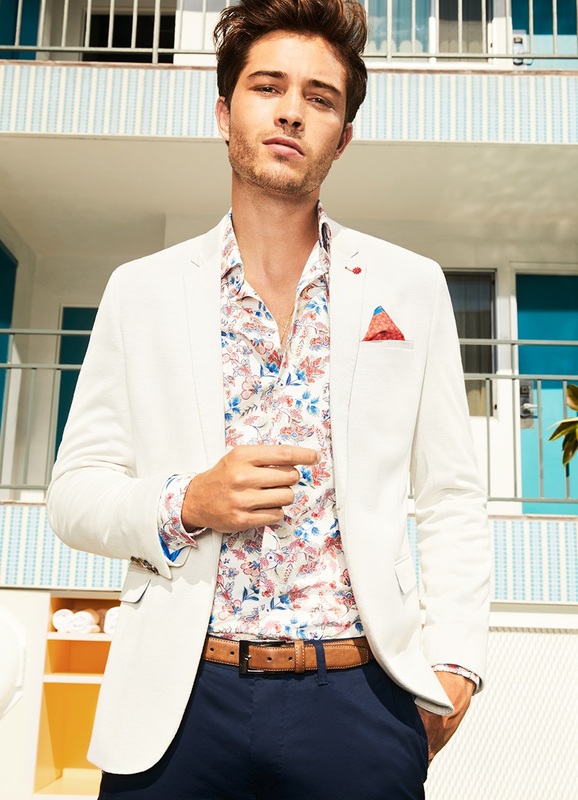 Fowler blazer beige $269, Ralston shirt white/pink $179, Winsor chino new marine $149. Branton blazer sky $249, Trey shirt white/navy $129. Daron blazer white $249, Pete shirt blue/white $179, Winsor chino new marine $149, Kalum reversible leather belt tan/mahogany $129. Eitan blazer red $269, Kolt shirt navy/red $149, Allonzo chino white $149, Ravon reversible leather belt light tan/dark tan $89. Rudd blazer dark navy $249, Jarad shirt pink $149, Axeel chino taupe $139, Oxton reversible leather belt cognac/navy $69. 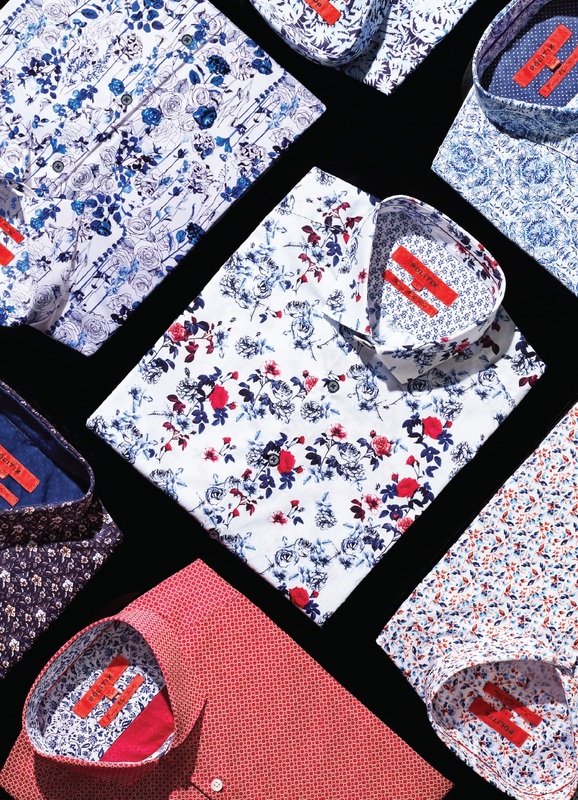 Bet big on print and pattern this summer for maximum impact and fewer layers. This is where our Red Label collection comes to play - your new go-to for Friday nights and special occasions. Looking this sharp isn't left to chance. Alexandro shirt white/blue $179, Allonzo chino white $149, Swaley reversible leather belt black $79. 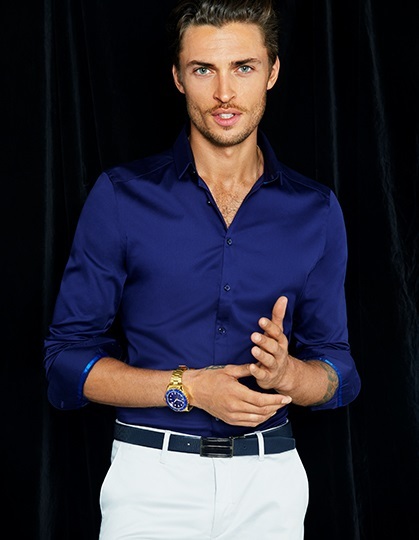 Westin shirt white/blue $189, Tarrik suit pant blue $169, Perkin reversible leather belt dark tan/navy $79. 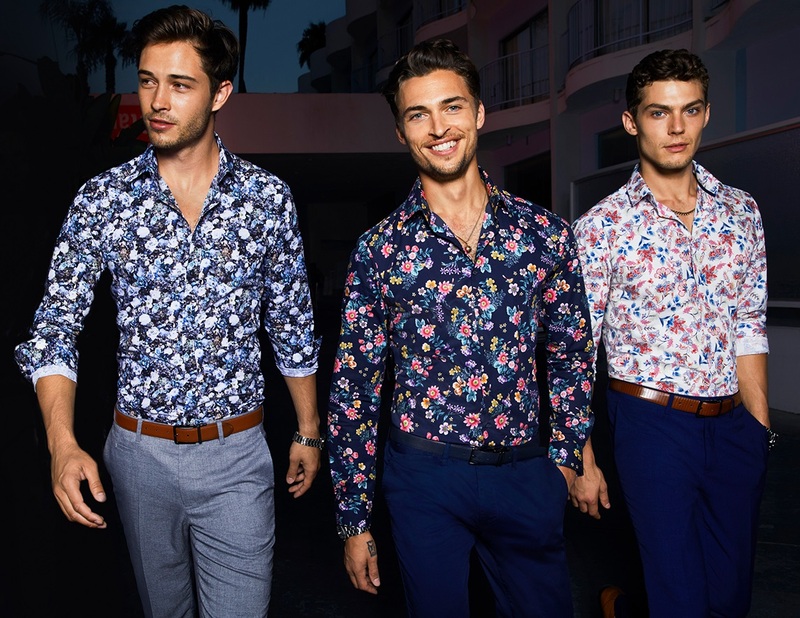 Marsh shirt white/cobalt $149; Teale short sleeve shirt white/navy $129; Caspar shirt magenta/white $129; Kylar shirt navy/orange $169; Massey shirt white/floral $159; Pete shirt blue/white $179; CENTRE Payton shirt white/pink $149. 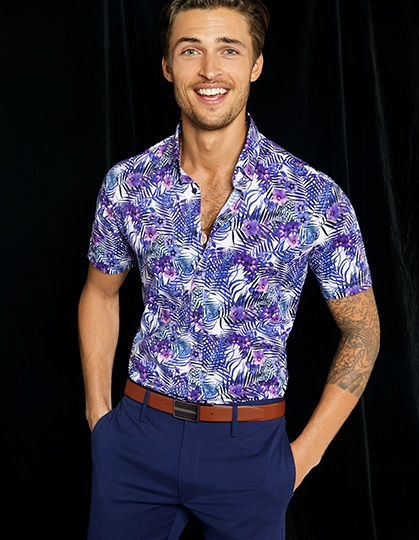 Usher short sleeve shirt floral $129, Axeel chino new marine $139, Stefano reversible leather belt tan/navy $89. 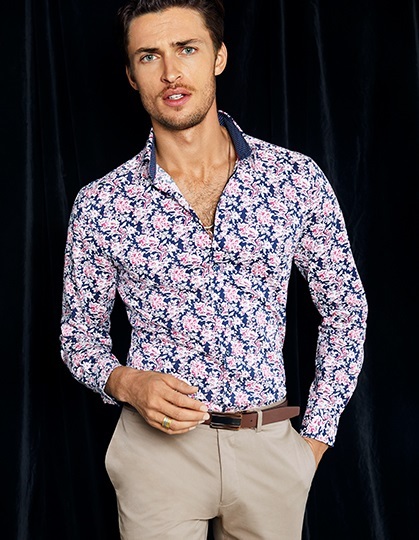 Lain shirt floral $149, Allonzo chino blue $149, Xaviar reversible leather belt tan/navy $79. Randall shirt navy/pink $129, Zac dress chino tan $169, Eldwin reversible leather belt black/dark tan $89. Edisson shirt navy $149, Allonzo chino silver $149, Stefano reversible leather belt tan/navy $89. Stir up trackside traditions to ensure you lead the style stakes come race day. 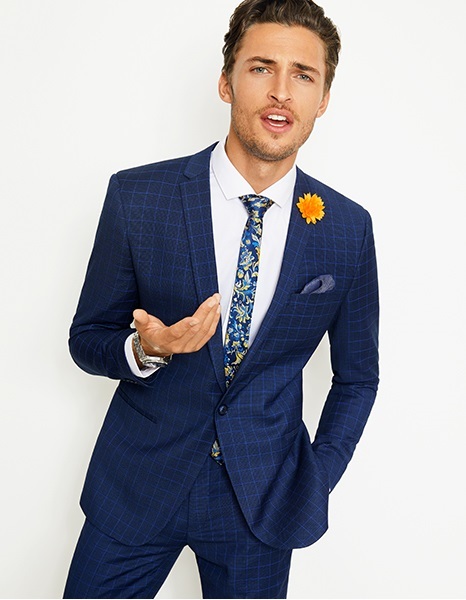 We’re talking bold checks and vibrant accessories, and when you’ve got the shirt for it, skip the tie altogether. Kalleb suit blue check $369, Edisson shirt sky $149, Cena pocket square silver $49, Hanley reversible leather belt tan/black $79. Jacobson suit grey/blue $369, Edisson shirt navy $149, Kalem tie yellow/gold $69, Sian lapel pin yellow $39. Kalleb suit blue check $369, Huston shirt blue floral $179, Cena pocket square silver $49, Hanley reversible leather belt tan/black $79, Selwyn leather shoe whiskey $269. Jacobson check suit grey/blue $369, Edisson shirt navy $149, Kalem tie yellow/gold $69, Sian lapel pin yellow $39, Lazzaro leather shoe whiskey $269. 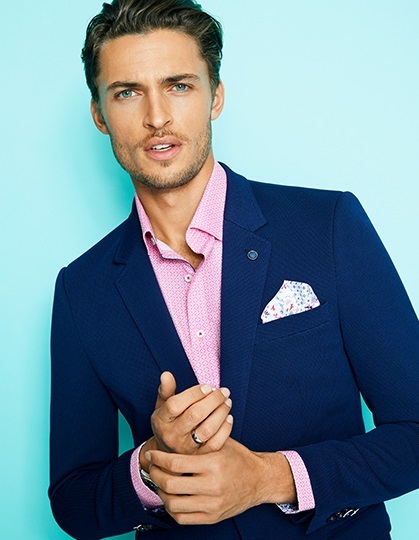 Ackerley suit blue windowpane $369, Laidley shirt pink $149, Yarin tie fuchsia $69, Crus pocket square fuchsia $49, Sian lapel pin fuchsia $39, Xaviar reversible leather belt tan/navy $79, Zacary leather loafer cognac $249. Benton linen suit sand $389, Shamus shirt floral $179, Nevern reversible leather belt light tan/navy $79. 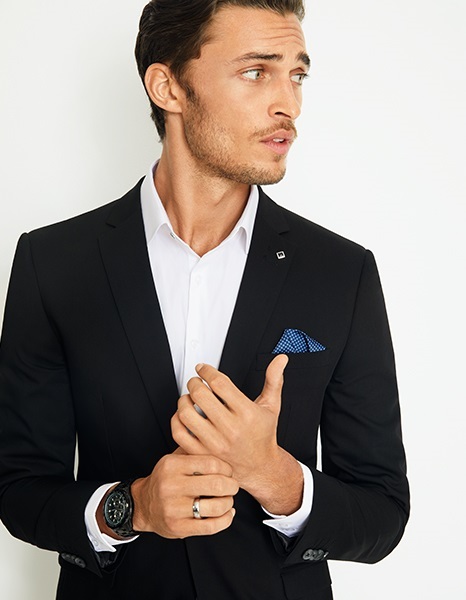 Fashion suiting calls for a trifecta of finishing touches – a tie, pocket square and lapel pin. 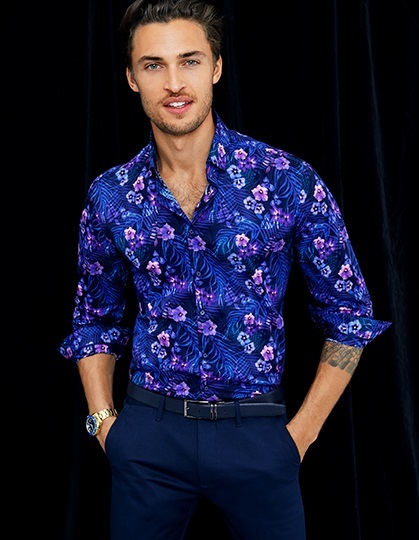 Paisley and florals are a no-brainer for a colour injection. But let’s be honest, it’s the floral lapel pin that will boost your odds. Trust us, these are details worth backing. Audie suit blue windowpane $389, Ned shirt white $149, Bryon tie yellow $69, Sian lapel pin yellow $39, Ario pocket square navy $49. 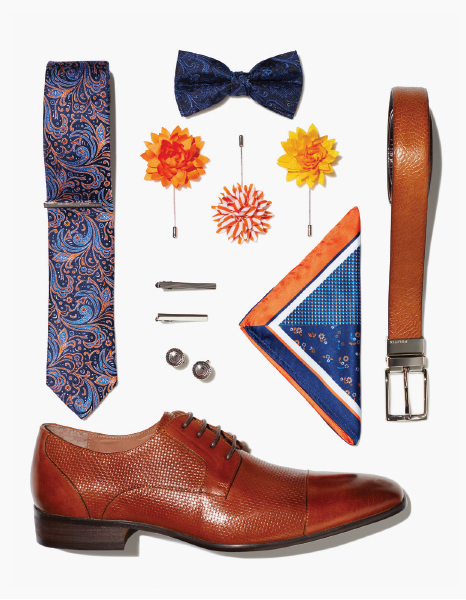 Orvin tie orange $69, Kelson bow tie navy $59, Floral lapel pins $39, Esco pocket square orange $39, Kalum reversible leather belt tan/mahogany $129, Cuff links $59, Tie pins $49. 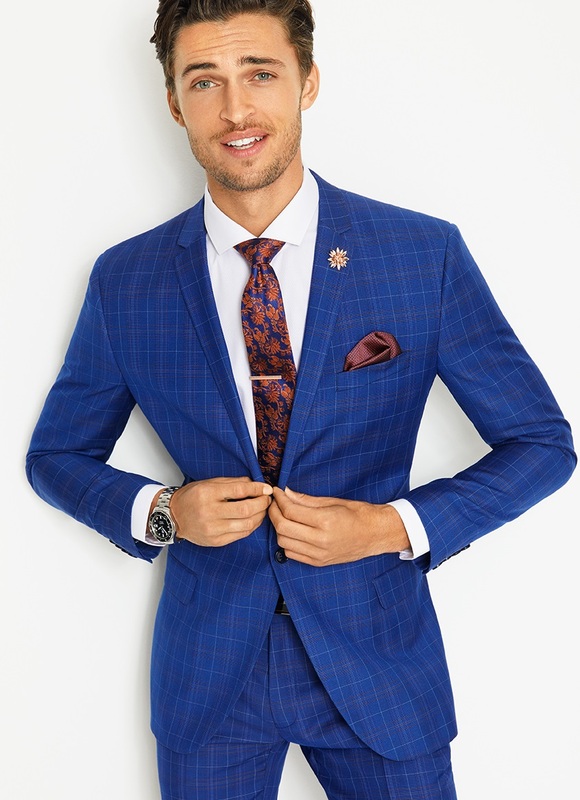 Stephenson suit blue check $369, Ned shirt white $149, Kodi tie orange $69, Leny pocket square orange $49, Clen lapel pin rose gold $29, Ciro tie pin rose gold $49. 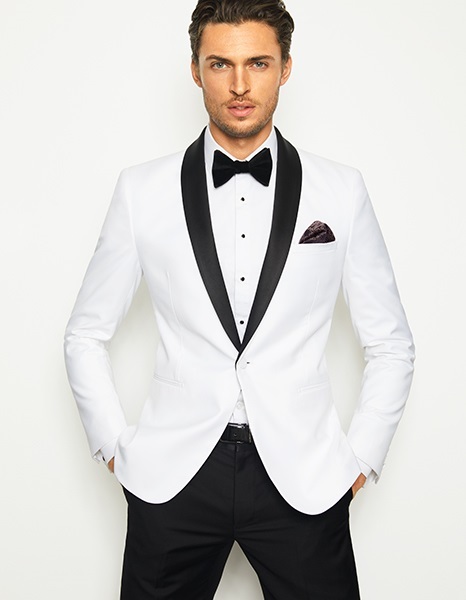 When the big night comes, your standard suit won't cut it. Special occasions call for daring statements and nothing says luxe like velvet – be it brocade, coloured or printed. Go on, play your cards right. Tonight, you're all in. Harrington velvet jacket sapphire $329, Ty shirt white $159, Samiir velvet bow tie blue $59, Cena pocket square silver $49, Newman dress pant black chintz $139. Maxxim velvet jacket floral $329, Aster shirt white $169, Petros tie black $69, Newman dress pant black chintz $139. Viktor velvet jacket black $329, Emilliano shirt white $169, Ravi pocket square ink $49, Newman dress pant black chintz $139. Huntley velvet jacket burgundy $329, Deevon shirt white $159, Ilia pocket square burgundy $49, Newman dress pant black chintz $139. 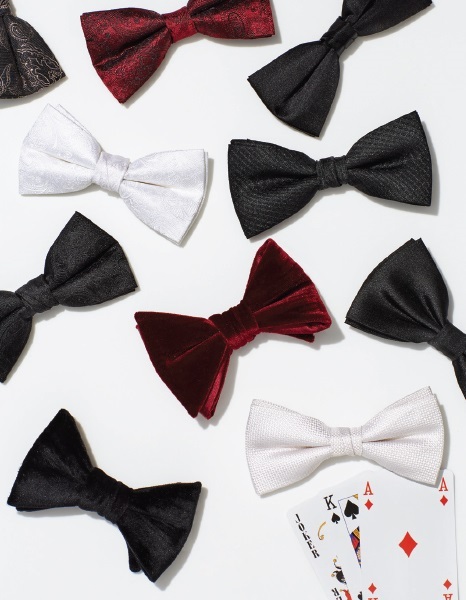 A bow tie and tuxedo are the perfect partners in crime. 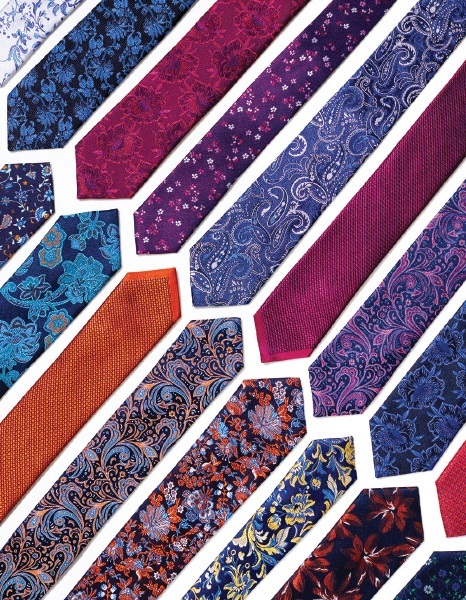 Roll the dice and opt for pattern, shine or colour to up the ante. Add high shine lace-ups to ensure you don't put a foot wrong on the red carpet. Matthias tuxedo jacket white $299, Clifford shirt white $169, Matias bow tie black $59, Mace pocket square black $49, Newman dress pant black chintz $139, Swaley reversible leather belt black $79. 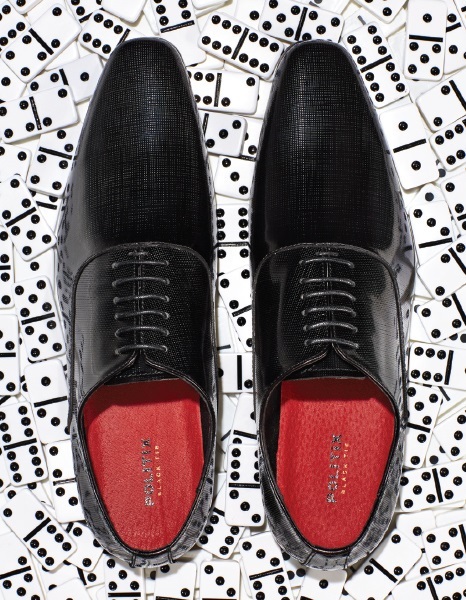 Kedric high shine leather shoe black $269. Viktor velvet jacket black $329, Emilliano shirt white $169, Ravi pocket square ink $49, Newman dress pant black chintz $139, Renato reversible leather belt dark tan/black $89. Zacchary tuxedo jacket black $329, Ty shirt white $159, Petros tie black $69, Newman dress pant black chintz $139, Swaley reversible leather belt black $79, Warick high shine leather shoe black $249.